Chief executive contender Carrie Lam has sought to clarify a pledge to resign if mainstream opinion is against her. Lam’s statement during a televised debate on Tuesday raised eyebrows, as critics questioned whether she had thought it through. “If the mainstream opinion of Hong Kong people renders me unsuitable to serve as chief executive, I will resign,” Lam said. She then said at a Wednesday night event with finance electors that she was not referring to fluctuating popularity ratings. “Of course I was not talking about personal popularity ratings,” she said. “They go up and down.” Rival John Tsang has been leading in all public opinion polls but one. 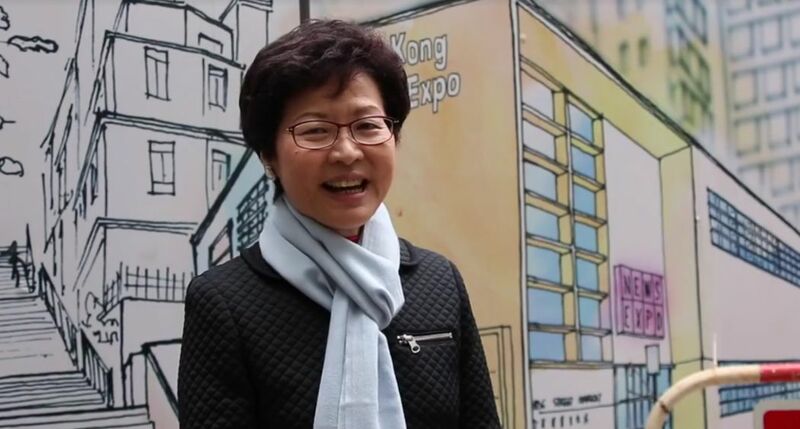 She said the chief executive is responsible to both Hong Kong and the central government, as well as tasked with implementing the Basic Law and the “One Country, Two Systems” principle. 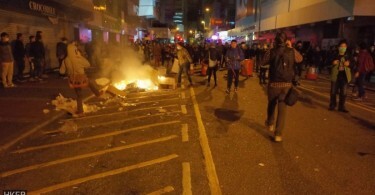 “If there appears an issue where the mainstream opinion of the Hong Kong people is contradictory to the responsibilities of the chief executive under the Basic Law, then the chief executive must make the difficult decision to resign,” Lam said. Lam did not give a specific example, but she could be referring to tasks that the central government hopes the chief executive will implement, but which Hongkongers generally oppose. Lam added that she would not resign easily, or because of emotional reasons, no matter how difficult the situation became, as it would be irresponsible to the public. 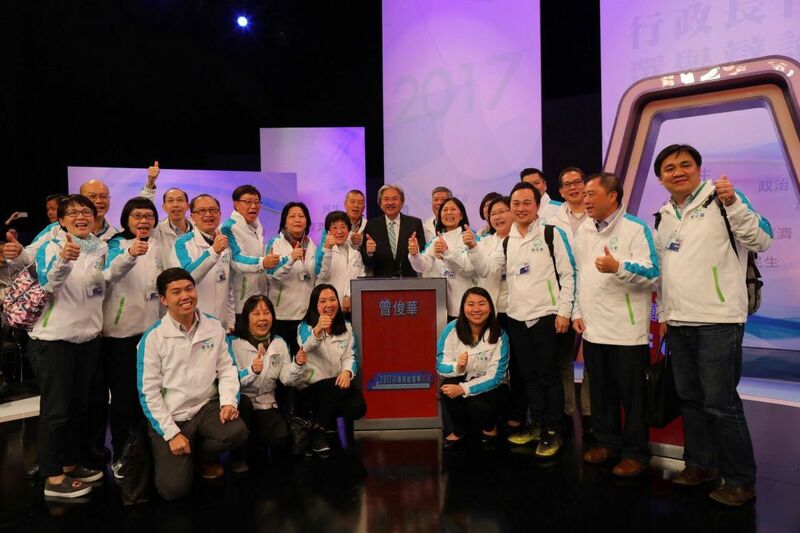 John Tsang and his team members at the joint TV/radio debate. Photo: Facebook/John Tsang. Tsang, Lam’s main rival, questioned her statements. “She talked about resigning that time, and – this time – she talks about not resigning. This is rather negative – a political figure should persevere in any circumstances,” he said. During the debate, Lam also said that she would hire Tsang’s assistant Julian Law Wing-chung if his boss was not elected. But Tsang said his team could not be bought with money. His team is widely seen as a key factor in running what has been a relatively successful public relations campaign. Soon after the debate, on Wednesday night, Tsang’s Facebook page published a video featuring Law, a political assistant who resigned from the government alongside Tsang to help him in the race. He said he and Tsang have discussed the issue of distrust in the government many times. “We wish to demonstrate through this election that a political leader can gain trust and support from the Hong Kong people – we think we have done so during this period of time,” he said. “After we set the bar, every politician will be unable to ignore the opinion of the public in the future… Sir [Tsang], the most important thing for a politician is not what you achieve, what you get, but how people remember you. You have made it,” Law added. The Civic Party has decided to award all 25 of its elector votes to John Tsang as he was “the one most capable of uniting Hong Kong people in fighting against the manipulation of Sai Wan.” Sai Wan is where the China Liaison, Beijing’s organ in Hong Kong, is located. Woo Kwok-hing is also running in the small-circle elections due to take place on March 26.